Google+ pages are spots on the Google+ social network where marketers of all sizes and in all industries maintain a presence in order to share information and interact with their current and (hopefully) future customers. 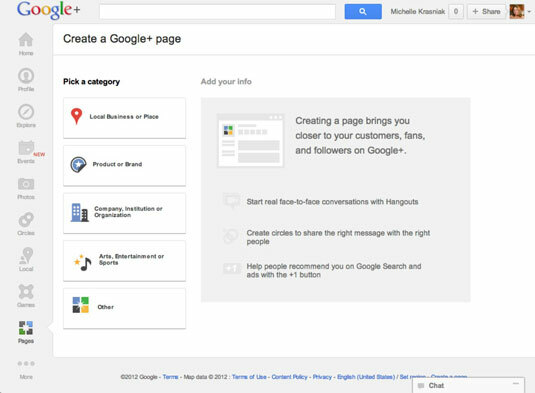 If you already have a Google account, you’re halfway to creating a Google+ page. If you use Gmail, Google Reader, Google Checkout, Google Calendar, Google Docs, or any other Google application, you have an account with Google. Don’t worry that it’s a personal account and you want to use it as a business page; you’ll be able to do so. Click the Create an Account link to the right of the Sign In button at the top of the screen. 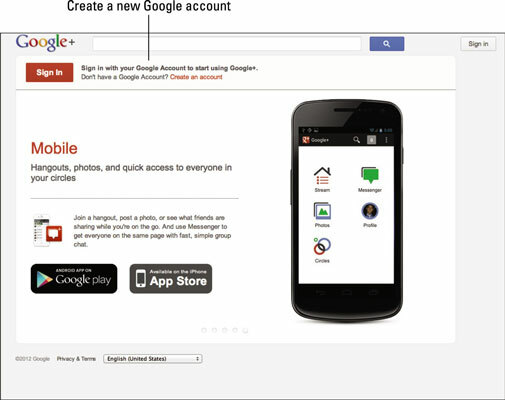 Google steers you to the Create a New Google Account page. Fill out the required information on the Create a New Google Account page. Google wants to know your name, desired username, account password, and your current (non-Gmail) e-mail address. You aren’t a robot, right? Sometimes the distorted words are difficult to read even for humans. If you can’t make sense of the splotchy letters, click the Refresh icon (an arrow making a circle) to get a new word image. As with all policy documents, read these carefully to ensure you understand how Google will use your personal information and to know what you can and can’t do with your Google account. Go to the Profile Set Up page. If you haven’t already signed in to your Google account, click the Sign In button at the top of the page. If you aren’t signed in, you see +You in the upper-left corner. If you are signed in, you see +yourname, where yourname is the name you provided when you created your Google account. Select the type of page you want to create by clicking the appropriate option from the list on the left. Local Business or Place: Select this category if you have a physical location customers can go to. Product or Brand: Select this category if you provide a service that doesn’t necessarily take place in only a brick-and-mortar location. Company, Institution or Organization: Select this category if you’re a school or non-profit. Arts, Entertainment or Sports: Select this category if you run an entertainment-based company. Other: This broad category is for everything else that doesn’t fit in the preceding categories. Hover your mouse pointer on each category to see examples of the types of entities each category is appropriate for, such as hotels, restaurants, apparel, financial services, and so on. After you click a category button, a sign-up form appears on the right. Add your information to the sign up form. Type your page name into the first text box (we recommend your company name), add your website address in the text box below that, and then select a category from the drop-down list. These categories break down into exactly what industry your brand falls into, such as Financial Services, Media, or Business and Industrial. If your specific industry is not listed, scroll to the bottom of the drop-down list, where you can select generic categories such as Brand, Product, Service, or Other. 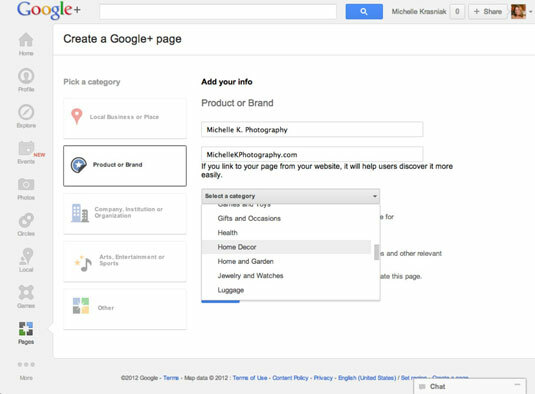 Select which Google+ users your content is appropriate for. These are age-related selections, so if you promote and sell alcoholic beverages, you would select the Alcohol Related option so Google+ knows not to make your page visible, to users who are not of legal drinking age. What this really means is only users who are of legal age can participate. Younger people can still view the content, however. Select the check box next to Yes, Please Keep Me Informed if you want to receive updates from Google+. Select the I Agree check box to indicate that you agree to the Page Terms and are allowed to create this page. As mentioned earlier, it’s always a good idea to read through the fine print in these situations so you know how to stay within the usage guidelines. The last thing you want is to have your page shut down and lose all of your hard work because you’ve broken a rule. Congratulations! You officially have a Google+ page.